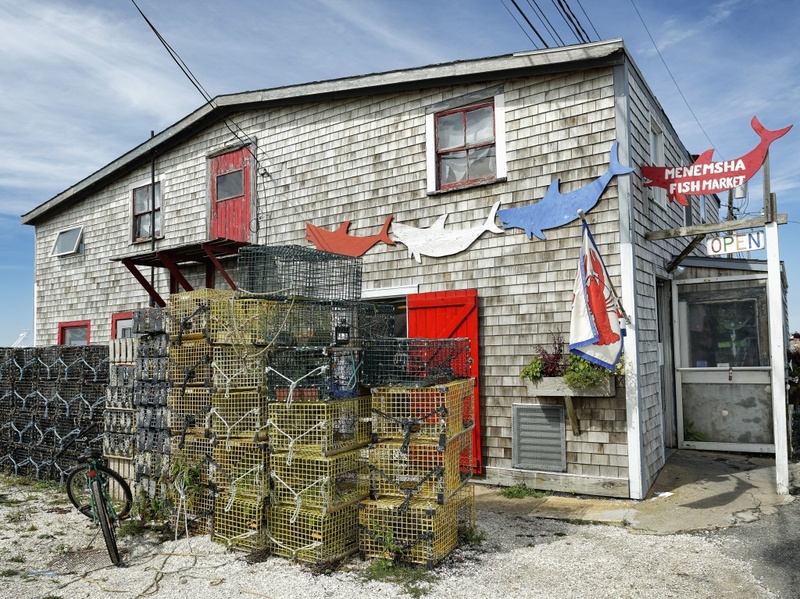 The steel used to build lobster traps like these, stacked up outside a fish market on Martha's Vineyard, is getting pricier, thanks to new tariffs. When he first started making lobster traps at age nine, the crates were made of wood and rope. But back in the 1980s, practically the entire industry switched to traps made out of wire grids. "It's got to be nearly 100 percent wire pots today in the lobster industry," says Morris. And here's where the new tariffs come in: that wire is made of steel. Many lobster traps are built from steel mesh made at Riverdale Mills in Northbridge, Massachusetts. CEO James Knott, Jr. shows me around. He points to three-ton coils of steel wire, stacked four high on the factory floor. "So this is the raw material that we start with this is called wire rod. And it's a hot rolled long product," Knott says. That wire gets stretched out, welded into a grid, galvanized, and coated in plastic. That wire mesh is then turned into lobster traps and other products, including security fencing. Knott says if they can, the company gets its raw steel here in the U.S., but it's become much harder to come by since President Trump started talking about tariffs. "The prices for the wire rod from first quarter this year to right now have almost doubled," he says. So they've been ordering some from Canada. But now they have to pay a 25 percent tariff on that Canadian steel. And since the tariffs don't apply to partially finished products, just the raw material, Knott says he's worried about competitors from Europe and China shipping in steel that they've already made into wire mesh. "What's probably going to evolve over the next 120 days or so is people will stop placing orders with us and start placing orders with foreign suppliers who compete with us making similar products," Knott says. Riverdale Mills has requested an exemption from the tariffs — one of nearly 19,000 exemption requests that the Commerce Department has received. Knott is s a self-described free-trader and lifelong Republican, and he says the tariffs aren't well thought out. "It's going to hurt a lot of people," says Robert Bayer is the Executive Director of the Lobster Institute at the University of Maine. In the lobster industry, it's not just companies like Riverdale Mills that are going to feel that pain. Lobster traps are going to become more expensive, whether they're made with American steel or foreign products. And that hits the lobstermen, who can't raise their prices to make up for it, he says. "The price of lobster is based on supply and demand. And it's not related to your costs as a fisherman," Bayer adds. Trap builder Bob Morris says he's a loyal American who wouldn't think of buying a foreign wire mesh. So he's going to have to charge more. "Now as a trap builder it's going to be uncomfortable to look a fisherman in the eye and say, 'Well, what cost you this last year is now that.' "
And the tariffs have also put Morris in a tough spot as a Trump supporter. "Alls I can say about it is, I hope you know what you're doing," he says. Morris says he's hoping Trump has a strategy that's going to pan out — that the tariffs will strengthen the economy in the long run. "I'm going to bear the brunt of it, I'm going to hope and pray for the best for our country, our corporations like Riverdale and the workers there, the fishermen, everybody. But if it goes awry, I'll stand and I'll be the first one to admit that I was wrong in supporting that." For now, he says, he's putting his faith in the president. April Fulton and Evie Stone contributed to this report.